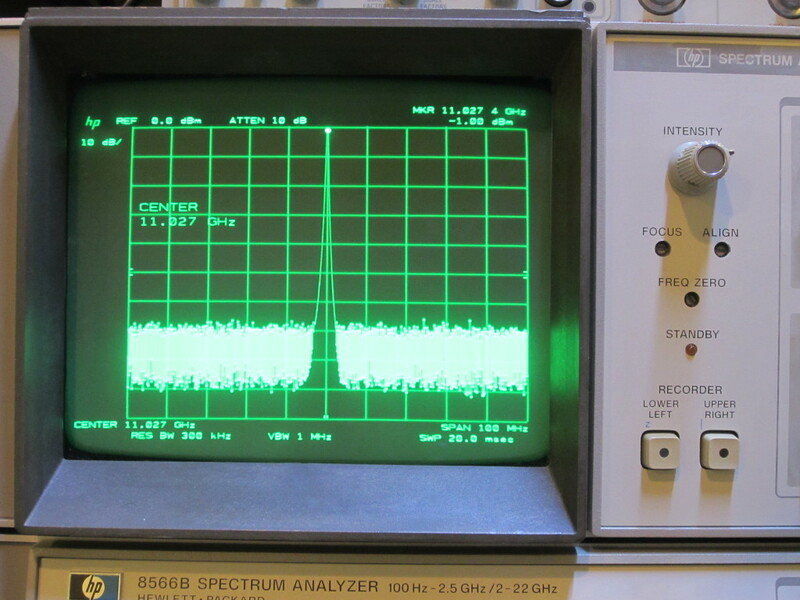 The latest addition to my lab is an HP 8566B spectrum analyzer. 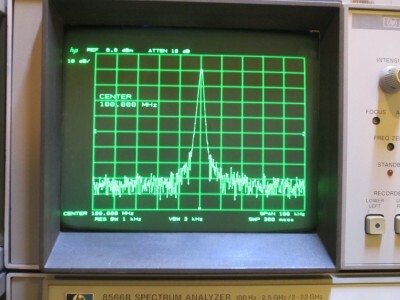 This isn’t just any spectrum analyzer, it was perhaps the best spectrum analyzer money could buy back in the late 80’s. 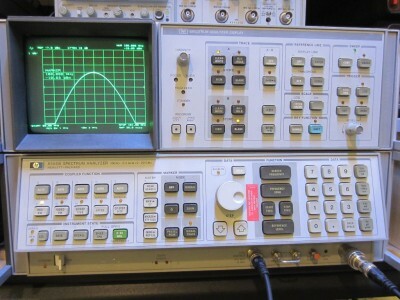 While it was discontinued in 1997 and has long become obsolete, its performance remains quite impressive even by today’s standards and still rivals that of many of its modern counterparts. 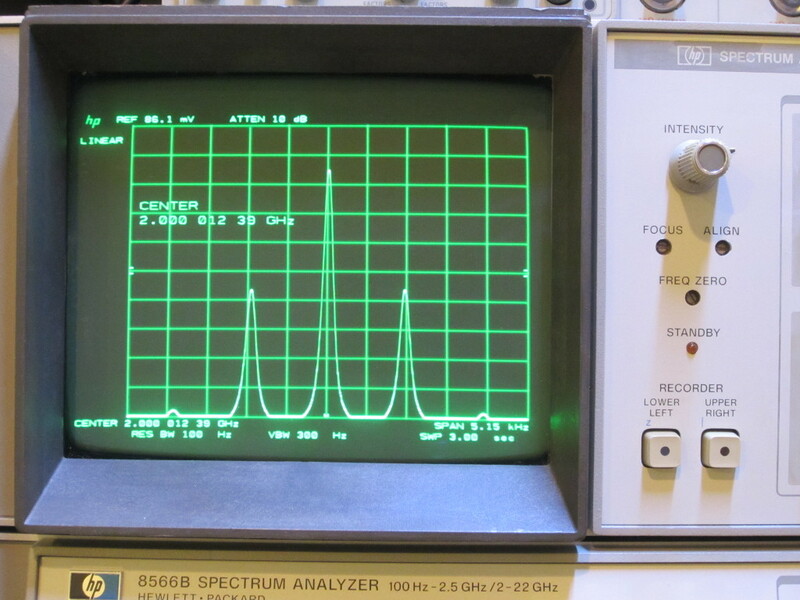 One thing the 8566B doesn’t do quite well though compared to any modern spectrum analyzers is its enormous weight. 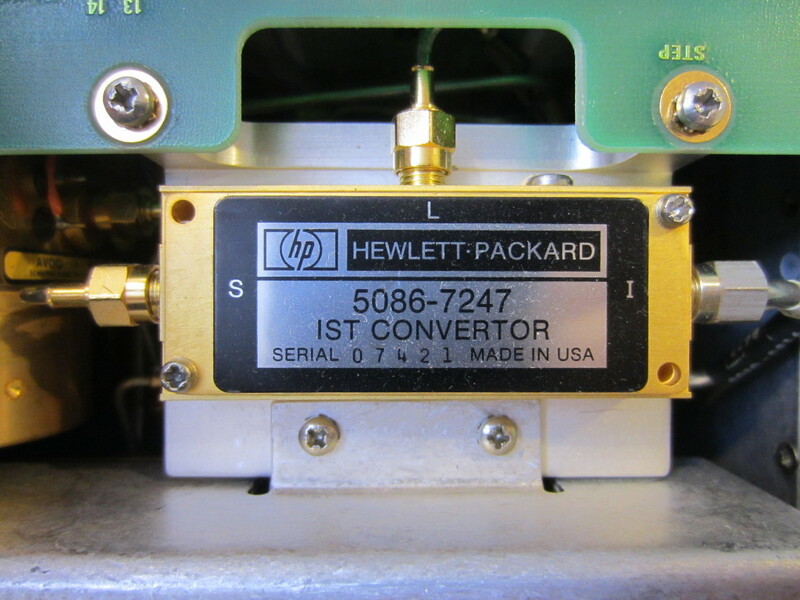 It is so heavy that engineers at HP had to split it into two units so that they could be moved by a single person relatively easily. Even so, the two units weigh in at more than 50 pounds each. And because it is so heavy, shipping damage is common for these used units (if you could buy one locally, it is probably the safest way to go). Mine is also no exception. My units arrived in two separate boxes. I was shocked at how poorly they were packed. 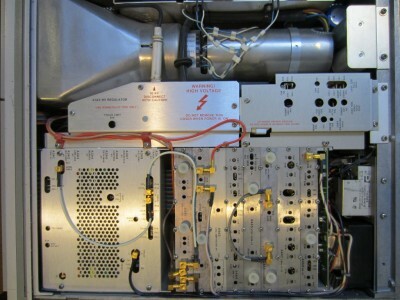 The boxes had gaping holes on them – probably due to the rough handling during shipping – and I could hear rattling sound in one of the boxes due to broken handles and other lose components. Alas, the typical cardboard boxes are not properly rated for the weight of these heavy equipment. 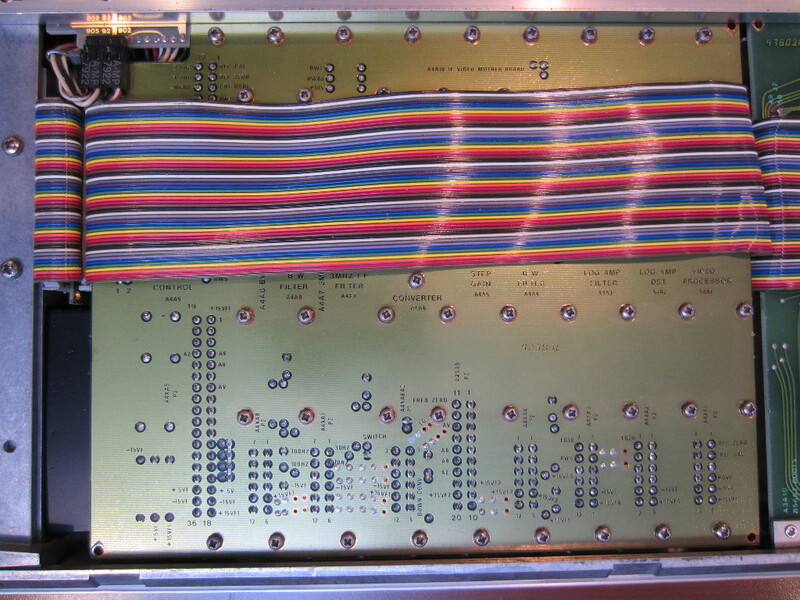 Anyway, my original plan was to do a comprehensive teardown of the IF/display unit and the RF unit just like I did with my HP 8642B before. But I was eager to bring the unit back to a working condition and did not want to risk the possibility of me inadvertently damaging it further during the teardown and re-assembly. Anyway, Jose from EB5AGV has an excellent page dedicated to his HP 8566A. There he took some very detailed pictures down to the board level. 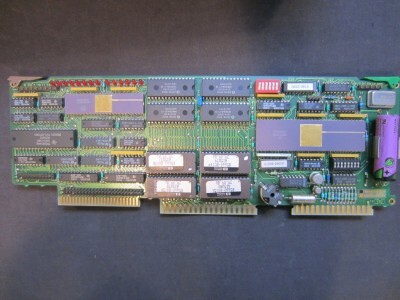 Although it was a 8566A not a 8566B, you can at least get an idea of what each individual board looks like. So for this post, I will keep everything at a high level only. I am not sure why that is the case, but because the metric and inch mixture proper servicing could be quite a bit more challenging as ideally two sets of tools would be needed. 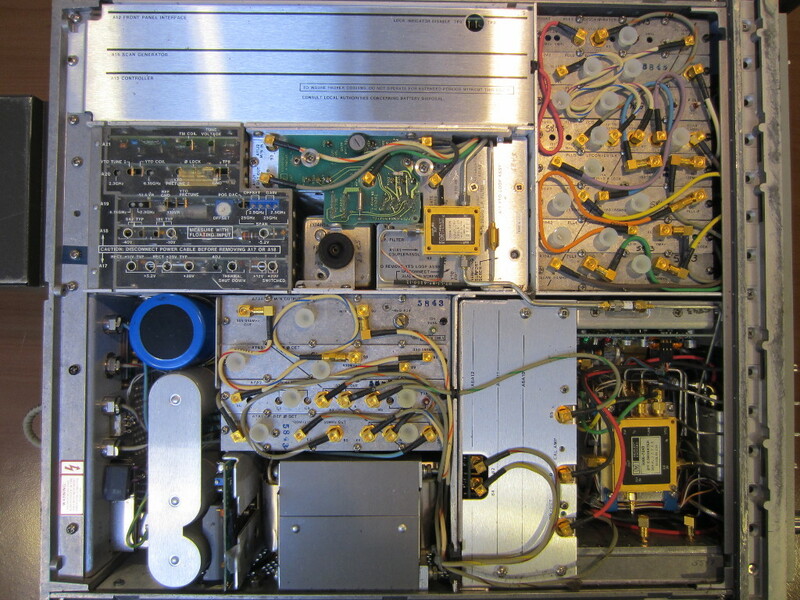 The IF/Display section (85662A) I received appeared to be an earlier version. 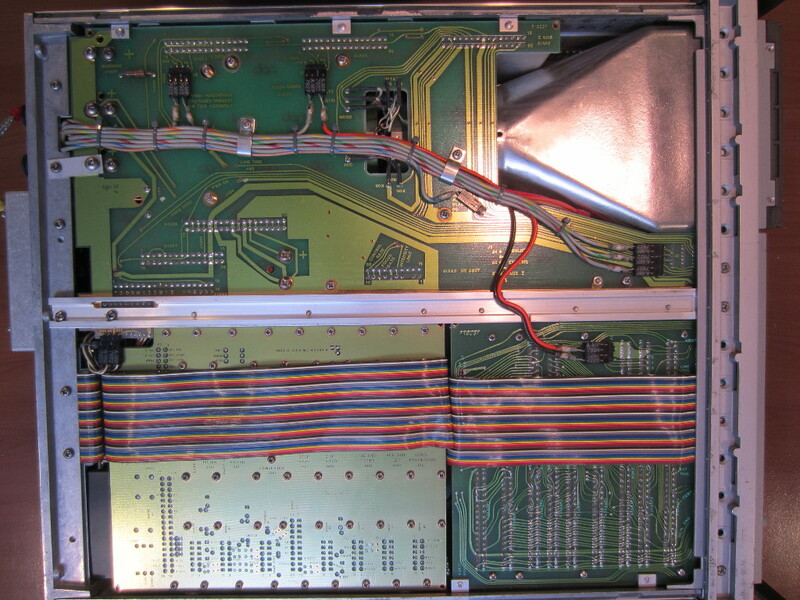 The back panel looks identical to the display section for the earlier 8566A. 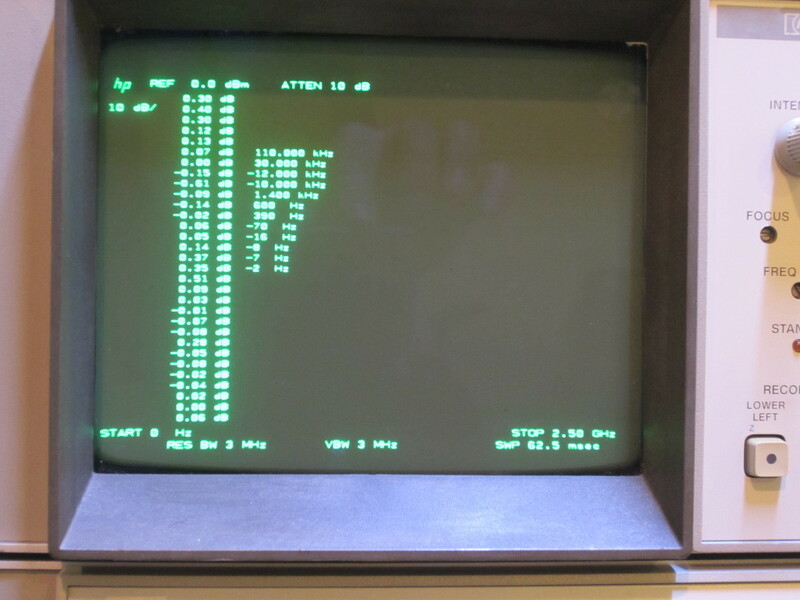 The only differences compared with the display unit for the later 8566B though, is the lack of four BNC connectors (IF IN/OUT, VIDEO IN/OUT) for the HP 85650A Quasi-Peak adapter (used for EMC compliance testing). 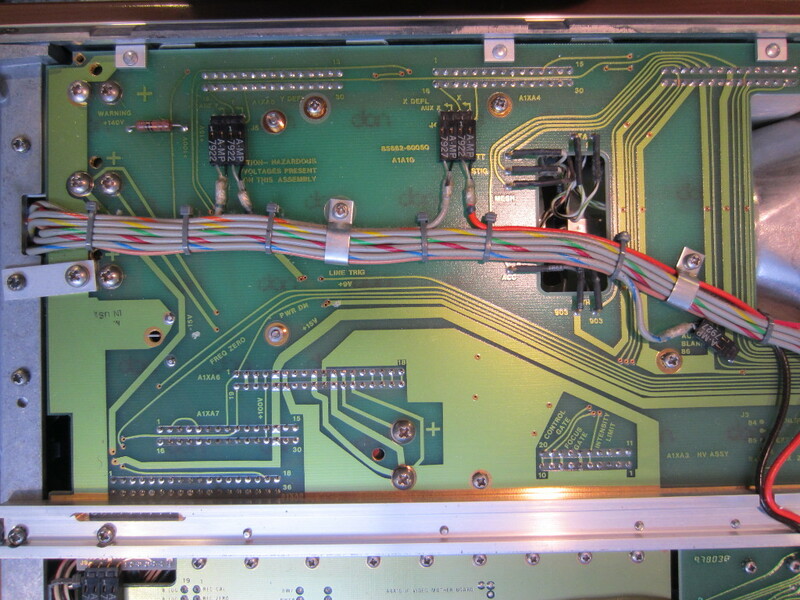 The following pictures are the closeups for each areas. 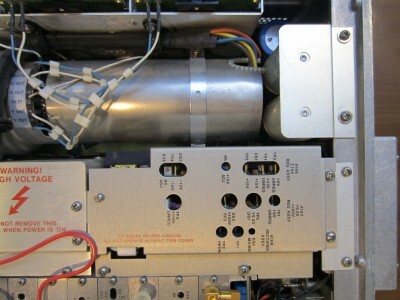 All the test points and adjustable components are clearly marked so the unit could be easily serviced by cross referencing the service manual. 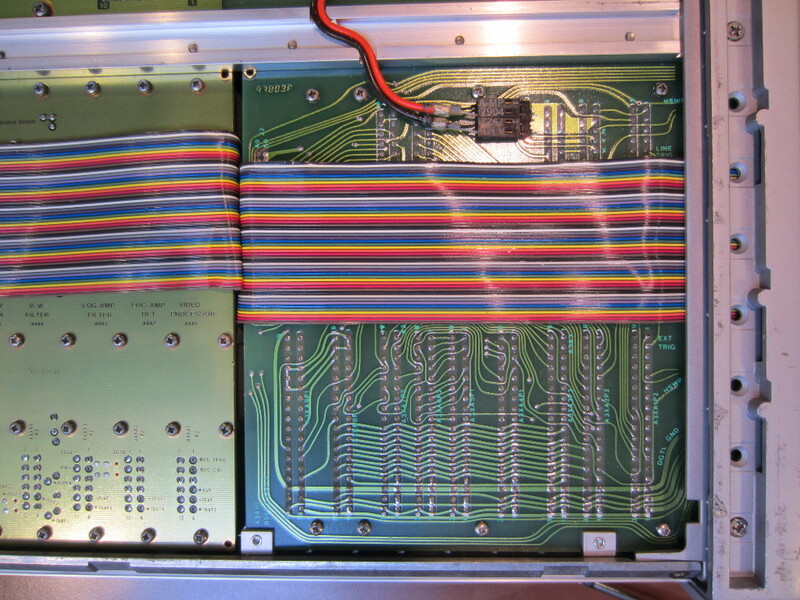 And here are a few more closeups of the bottom side. The display section seemed to have survived the brutal shipping handling pretty well, except for the slightly bent top cover which made the initial removal slightly difficult. Everything else checked out well and seemed to be in fairly good shape consider the age of the unit. Now moving to the analyzer half of the unit (85660B). The picture on the left below is the top view of the analyzer section after the top cover is removed. Only a few test points can be seen on this side. 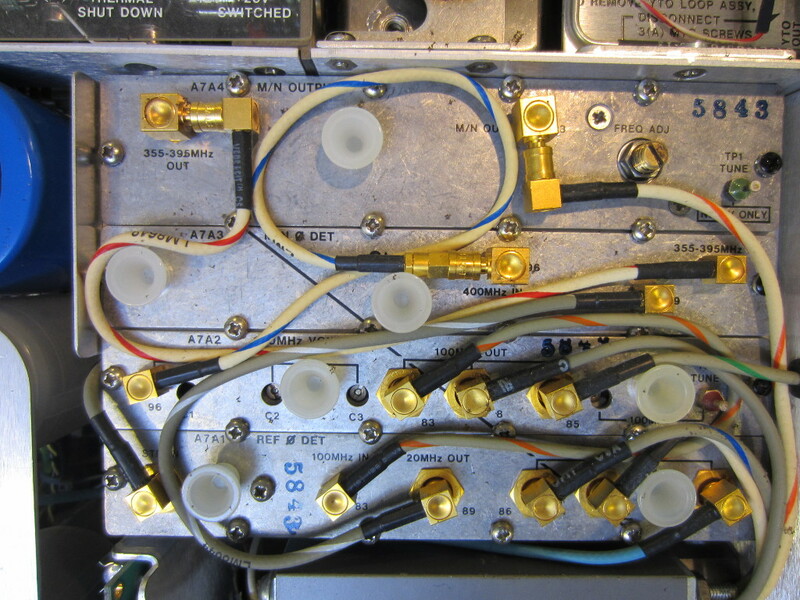 Some test points and screw designations are overlaid on a piece of plexiglass mounted on top. 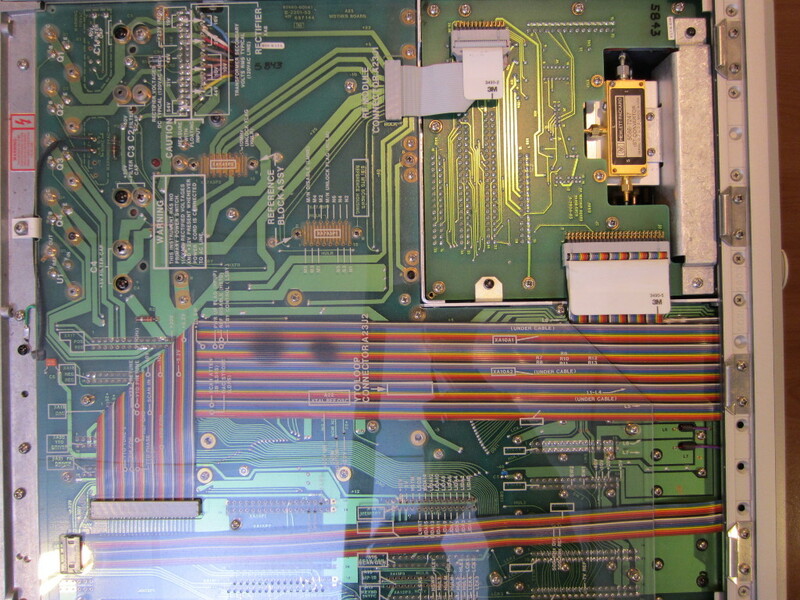 Besides the two dark spots on the ribbon cable due to dust settling over heat generated by some components underneath, the inside looks surprisingly clean. The closeup of the first converter is shown in the picture to the right. 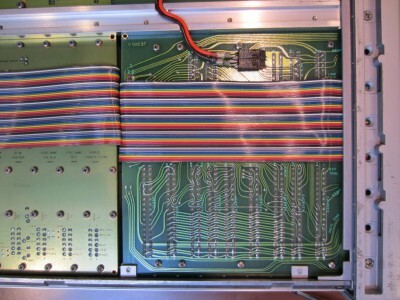 Here to the left is a picture showing the inside after flipping the analyzer over and removing the bottom panel. 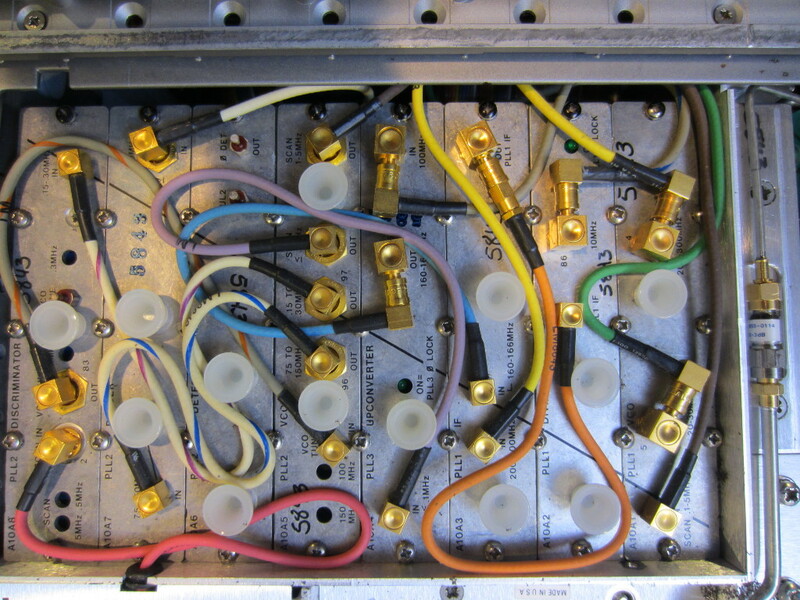 You can see the OCXO (ovenized crystal oscillator) in the middle next to the YTO (YIG tuned oscillator). 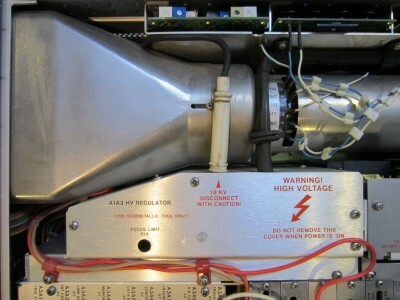 The picture to the right shows the closeup of the second converter. 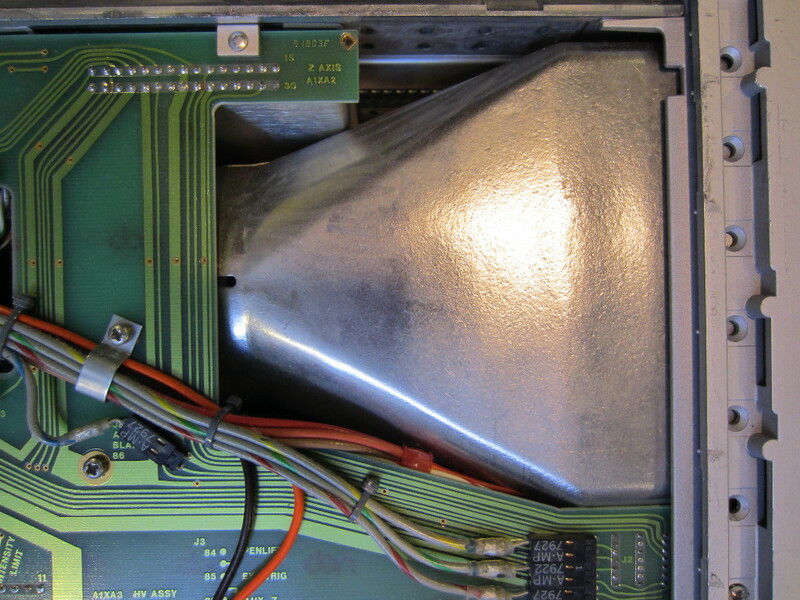 As I mentioned earlier, there was some rattling noise inside the shipping cardboard box for the analyzer unit. The noise was partially due to the two snapped off handles hitting against the case. 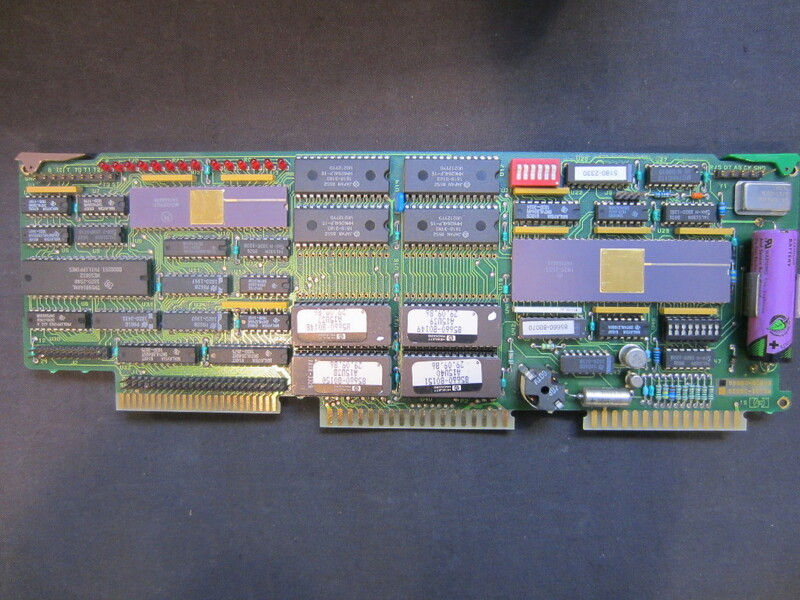 It became apparent after I removed the cover to the three controller assemblies that at least two of these cards had become loose, this could have also contributed to the rattling noise. Luckily, there’s no other visible damage. 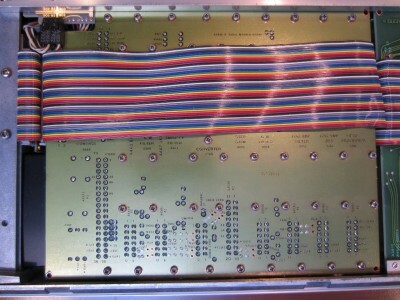 I pulled out the A15 controller board and checked the voltage of the backup lithium battery. 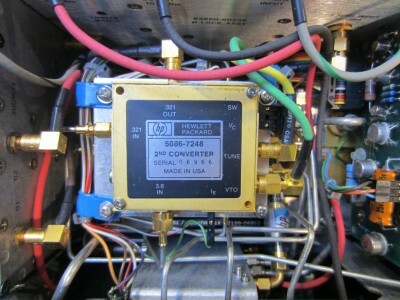 The battery still measured at 3.7V and looked to have been replaced not too long ago. 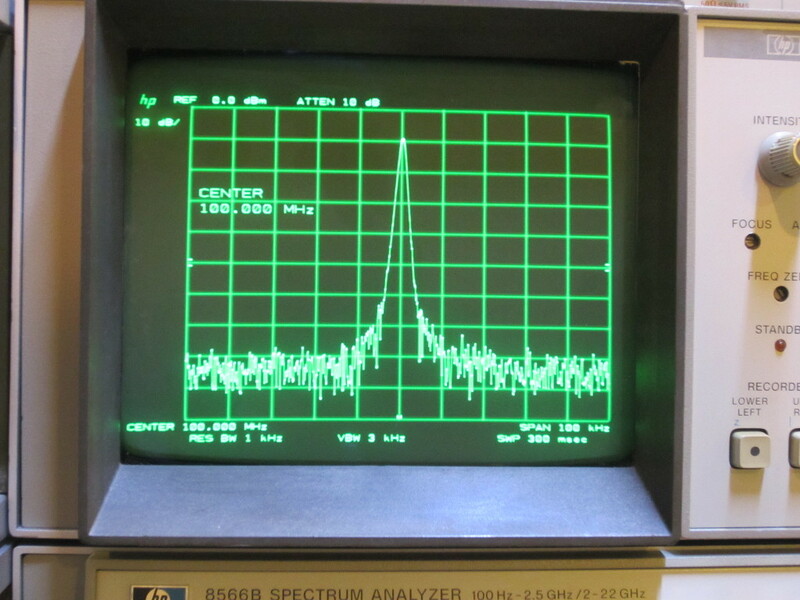 I guess that this spectrum analyzer was just removed from some test facility recently. Typically, these batteries are rated for a service life of 3 to 4 years. One good thing about the 8566B is that, according to manual, the battery is only used to maintain instrument states, error correction data and downloadable programs and it does not affect the calibration of the instrument when the battery is depleted. After the initial visual inspection and having re-seated all the loose cards, I powered on the unit powered without any issue. All the correction data looked good, well within the 1 dB range. 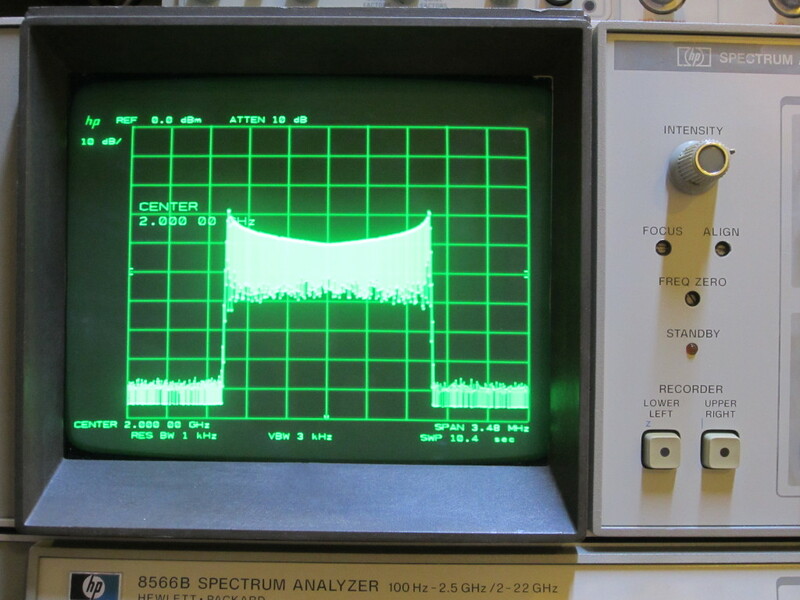 To the right is an image showing the 100 MHz -10 dBm calibration signal after I ran it through the calibration routine. 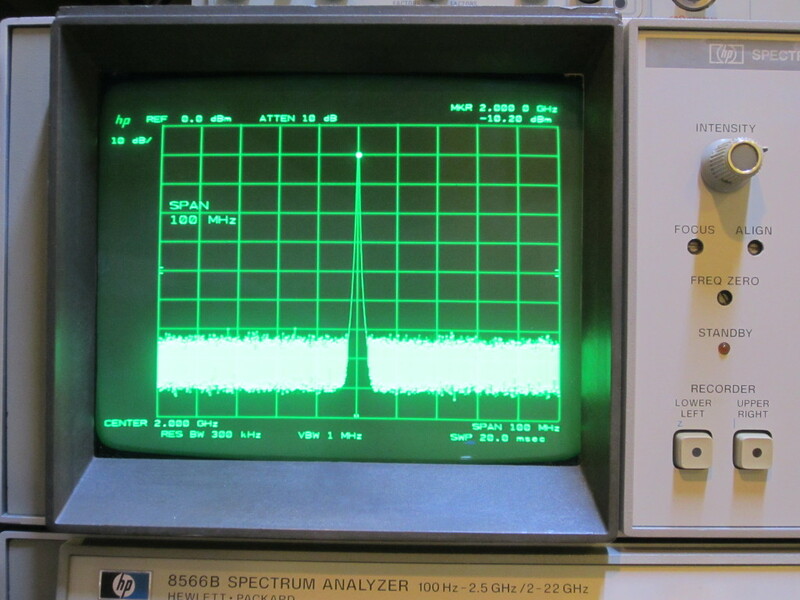 And here is a picture of a 2 GHz -10 dBm CW signal coming from my HP 8642B. 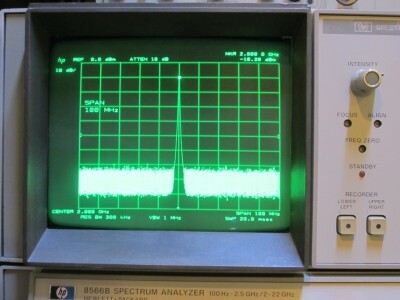 The picture to the left below shows the 2 GHz signal with frequency modulation. 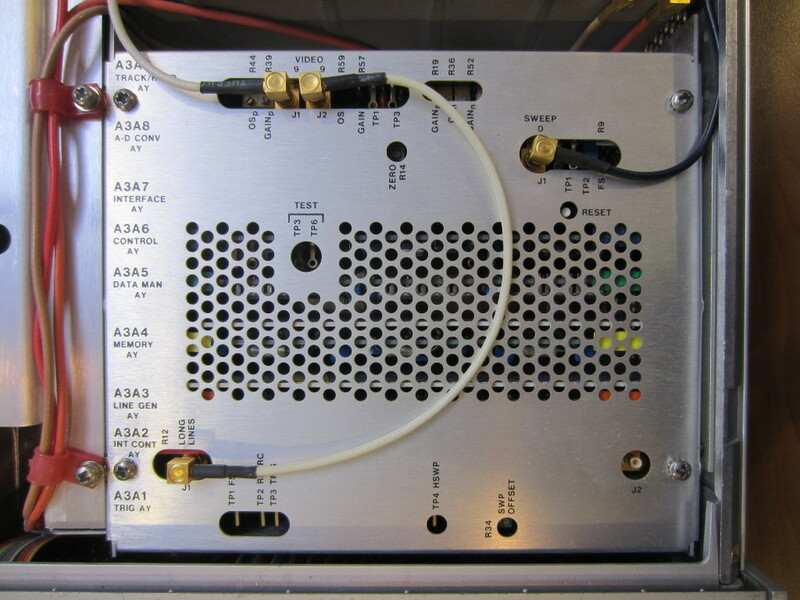 And the image to the right shows the same 2 Ghz carrier with 100% amplitude modulation. The amplitude was displayed in linear scale and the side lobes from the AM signal can be clearly seen at 50% level of the carrier. I have purchased a HP 8566B and it was not well packed when shiped one feet was broken,that is not a big problem but the display is in the upper right corner bent.The bottom left and bottom right corner have 90 degrees but the upper left and right are not 90 degrees.I can not udjust it with the align screw.Is it possible to adjust it from inside? In theory you could try opening it up and see if you can hammer out the corners. 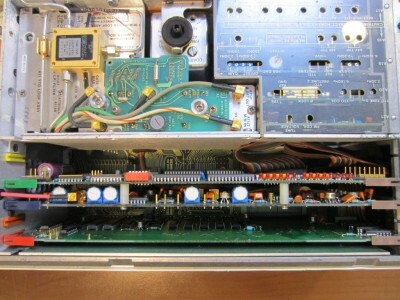 But the inside of the unit is extremely densely packed so it might be difficult without at least removing most of the component first. I just happened to did some repair on my HP8566B and you can see it here: http://www.kerrywong.com/2018/05/10/hp-8566b-spectrum-analyzer-yto-unlock-repair/. I also have a video towards the end of that post. Good luck! you may adjust it internally. 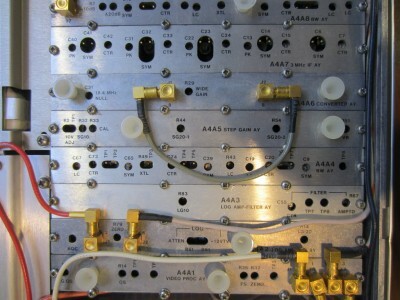 Find Test and adjustment manual and tray to adjust ORTHO and PATT adjustments. I have both the 8566 and 8568 analyzers, and have replaced the CRT displays with the LCD units from http://www.simmconnlabs.com. Now I don’t have to worry about leaving them on for long periods while I’m doing something else. Highly recommended! 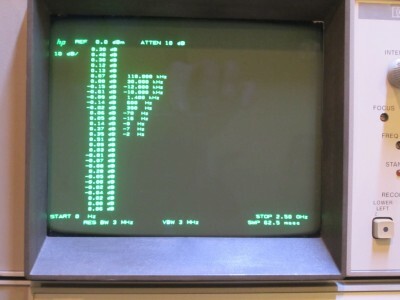 I looked at these replacement LCD’s briefly. They are unfortunately quite pricey :(.